Golden images, winged lions, proud kings, strange and magnificent creatures emerging from the sea, Judgment Day, and the Holy Sanctuary . 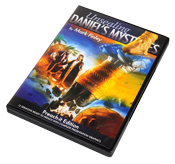 . . these are all part of the fascinating colorful book of Daniel. This complete preaching kit includes 12 complete sermons and presentation graphics, offering a chapter-by-chapter look at this powerful message for today. * Slides can also be presented using any consumer DVD player. Multimedia presentation requires projection hardware, software compatible with JPEG file format, and a DVD-ROM drive. PowerPoint files require Microsoft PowerPoint 2000 or newer. PowerPoint files require Microsoft PowerPoint 98 or newer. Keynote users should also be able to open PowerPoint presentations in Keynote.